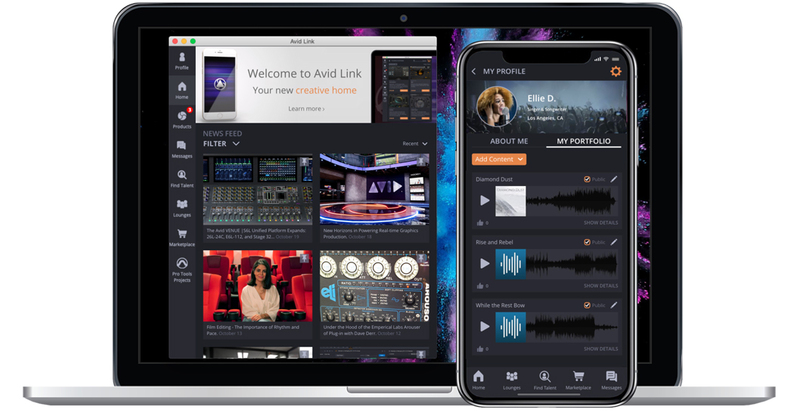 Avid&s new (and free) Avid Link App for macOS, Windows, iOS and Android offers a variety of content and features for all creative users, not only Avid users, under one interface - for which it also provides some special features. On the one hand, Avid Link wants to be a kind of social network for creative people in the fields of film, music and television: they can present themselves and their work, network and communicate with each other and even collaborate on (pro tools) projects. Avid Link also replaces (and extends) the Avid Artist Community, whose content - such as user profiles - is adopted. Avid Link also wants to function as a kind of job exchange with the help of which potential comrades-in-arms for creative projects can be found or a creative can be offered a job. To do this, you must indicate your abilities in your profile and give samples of your work. On the other hand, the Avid Link App replaces the previous Avid Application Manager and serves as central administration for all Avid programs. Programs can be re-/activated, automatically updated and administrated. New products such as plug-ins, apps, training videos and hardware can be purchased in the Marketplace. Avid Link is also a kind of information portal that provides news about new products and developments in the industry as well as tips and other content such as live videos of Avid&s trade show appearances. The Avid Link App can be installed for free on your smartphone or tablet via Apple&s App Store or Google Play, or downloaded as a version for macOS or Windows directly from Avid.